After hearing of his siblings’ “amazing experiences” from their time at Northwestern, Alex knew he wanted the same. 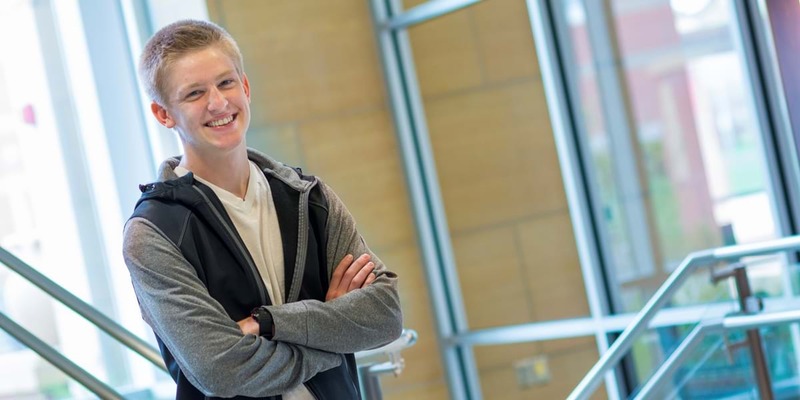 In addition to staying busy as a sociology major, Alex has run for Northwestern’s cross country and track teams, been a member of chapel worship teams and volunteered on two spring break mission trips. He is serving as a resident assistant in Hospers Hall and is involved in La Mosaic and International Club. Alex has aspirations of becoming a social worker or counselor and hopes to pursue a graduate degree after Northwestern. I realized I’d really enjoy studying sociology when I found myself in constant observation of society and the unique array of cultures that were always surrounding me. Instead of staring at my phone before class, drifting through social media, I would sit back and watch how nearly every person in the class had the strange urge to mess with their phones. I soon realized that my observational gaze made me want to pursue a field that enabled me to learn about people and the reasons for their actions. Sociology has enabled me to see both sides of every story. Whether this is because of the countless number of times we've read C. Wright Mills’ “Sociological Imagination” or through in-class discussions where I hear an article interpreted in two contrasting ways, sociology has prompted me to slow down my judgment of a belief and take into consideration the many different ways of interpretation. I’ve applied these lessons to my faith, being slow to anger and slow to judge. Sociology has developed in my heart great compassion for the people who are marginalized and for those who are oppressed and forgotten. Sociology has led me to focus my faith on loving others despite their circumstances. I can’t go through a semester of sociological texts without relating them to Scripture about how to embrace and advocate for vulnerable people. As Christians we are called to love, and sociology has helped me do just that. One of the sociology department’s biggest strengths is the many in-class discussions. Whether you are an introvert or an extrovert, in-class discussions are so useful for furthering understanding of articles, listening to beliefs of other students, and learning how to formulate a response in reference to an article. The sociology professors do an excellent job of giving students a variety of different projects, whether that’s designing and creating a bulletin board presentation in the hallway or actually observing how society views you as you are deviating from social norms in public. The sociology classes are always challenging you to try something new. At Northwestern, I’ve gained true friendships. After high school, I was ready for a new scene, a new group of people, and a place where I could be myself completely. I found that here. I found it in my dorm, in my classes and on my sports team. My dorm had the biggest impact on me. Right from the start, upperclassmen took me in, ignoring the fact that I was a freshman. There seemed to be no hierarchy between the class years. The guys in Hospers accepted me for who I am and took interest in my interests. This atmosphere is exactly what I needed.